The ham radio wire antenna is the most common form of antenna used by ham radio operators. Here is what aspiring and novice ham radio operators should know about what makes them reliable. The main reasons for its popularity are that it is affordable and relatively easy to install. In many cases, a wire antenna may be the best solution (compromise) for your specific location ... especially if you build it yourself! The amateur radio wire antenna is especially economical when it is homemade! There are a few reasons for this. You can use the parts you have in your "spare parts box". You can buy parts at flea markets and hamfests for next to nothing (compared to buying new). You can use various non-conducting materials as insulators. You can make (otherwise expensive) coaxial transmission line current chokes by coiling your coax. Learn how here. You learn a lot about antennas in the process! Antenna length: obviously, a 160 meter dipole will require much stronger wire (#14 Stranded (7x22) Copper-Clad Steel) than a 10 meter dipole (where #14 Stranded (7x22) Hard-drawn copper will do). Solidity of supports: a dipole strung between two trees will require special considerations (#13 19 strand VariFlex Insulated) whereas a dipole between two solid buildings will not as much. Wind: a notoriously windy location will require stronger wire than a sheltered location. Ice storms: go for the strongest wire you can afford if you live in an area where an ice storm is likely to occur. Salty air: you should use wire with a polyethylene or PVC jacket to prevent corrosion from weakening your antenna wire. Heavy industrial pollution: the recommendation is the same as for a salty air environment. Use jacketed wire. "Stealthiness": use strong and very thin wire (such as #26 VariFlex Insulated (19 strand) CW) with sky colored button insulators ... and your antenna will be nearly invisible! Quads, Wire Beams: I would recommend Flex-Weave™ wire by RF Davis. They offer #14 168 strand and #12 259 strand (! ), bare or insulated (PVC or polyethylene). Portable antennas: strong and very thin wire such as #26 19 strand VariFlex™ Insulated is perfect for this application. Light, durable and very flexible. Center insulator: With a ham radio wire antenna that do not require a balun, I recommend a glass-filled ABS insulator with built-in drip lip around SO-239 connector. It comes with a hole on top to anchor inverted-Vs. Also, you might consider the excellent, but slightly more expensive, DELTA-C Center Insulator by Alpha Delta Communications. But big (heavy) ceramic insulators have become harder to find ... as well as (non-conducting) clothesline rope! Dacron® type rope has come to our rescue. It is extremely strong as well as UV and abrasion resistant. Use the 3/8" size for the center insulator and pulley and the 3/16" to tie the end insulators to end supports. Take down and carefully inspect all parts of your ham radio wire antenna at least one a year for damage. designed and pre-tuned for best performance (although admittedly under ideal conditions). For example, I have been using a Carolina Windom™ for 80-10 meters for years. It is the best commercially made multi-band (no traps) single wire antenna that I have ever used. I do get much better results than any commercially built wire antenna for 160 meters with my homemade wire antenna. 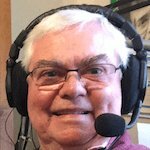 But I must admit that I have not tried the Carolina Windom™ 160 yet! Will the homemade wire antenna perform as well or better than a commercially built wire antenna of the same type? Often it will ... when you design it to fit your specific surroundings and ground conductivity. Lets face it. 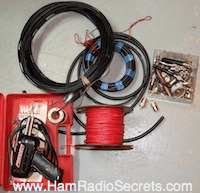 Most hams buying a commercially made ham radio wire antenna will be reluctant to modify it to better fit theirs surroundings and ground conductivity!